I love me some Japanese food. I’ve always had a fascination with seafood since I was a kid, and am of the firm belief that everything from the sea should be eaten raw. Not that there’s anything wrong with cooked seafood, but there’s nothing that can really compare, IMO, with the sweetness of fresh seafood. Mel and I went to Itacho over the weekend, and they’re still the best sushi place I’ve ever been to. My wonderful experience there was only tempered by the fact that the staff can be quite…blur, and the hefty price tag. But no biggie, good food like that is worth the price and bumbling staff. 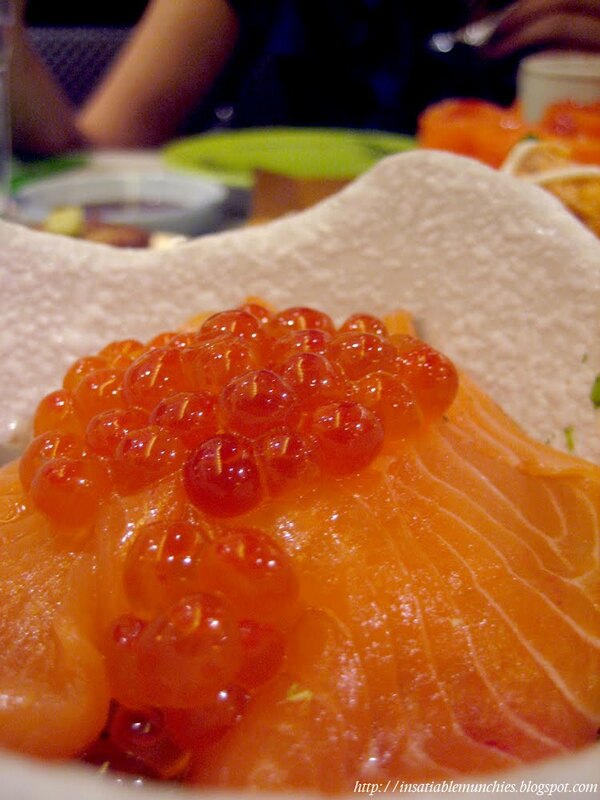 My favourite – Salmon and Salmon Roe roll. 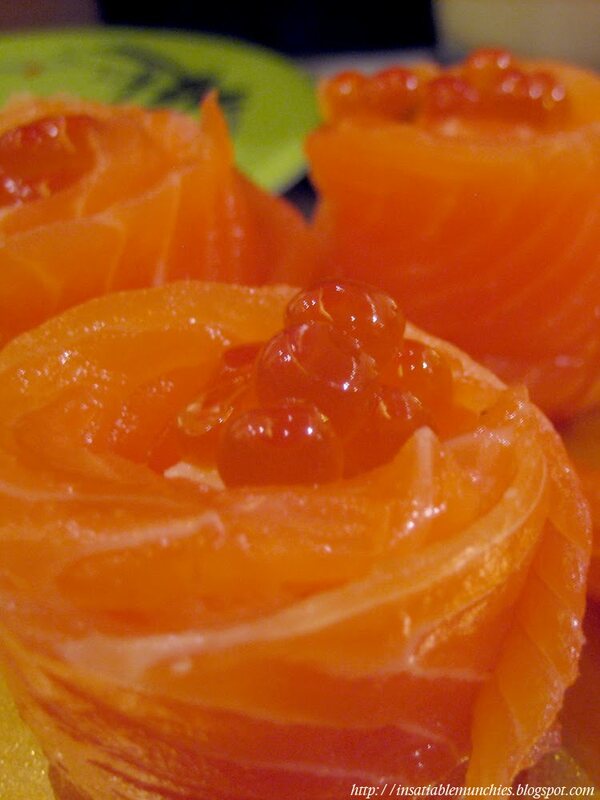 Super fresh slices of salmon wrapped delicately around a pinch of rice (that is really just there for the structure) and topped with salmon roe (my little bubbles of absolute joy!). The thick, silky salmon leaves absolutely no aftertaste, and the salty roe is just the perfect match for it. The best things truly come from nature. The sister dish of the above-mentioned roll, this Salmon mini bowl is basically the same thing, deconstructed. This one gives the eater the opportunity to just have mouthfuls of just the salmon roe, which sometimes is the needed thing. 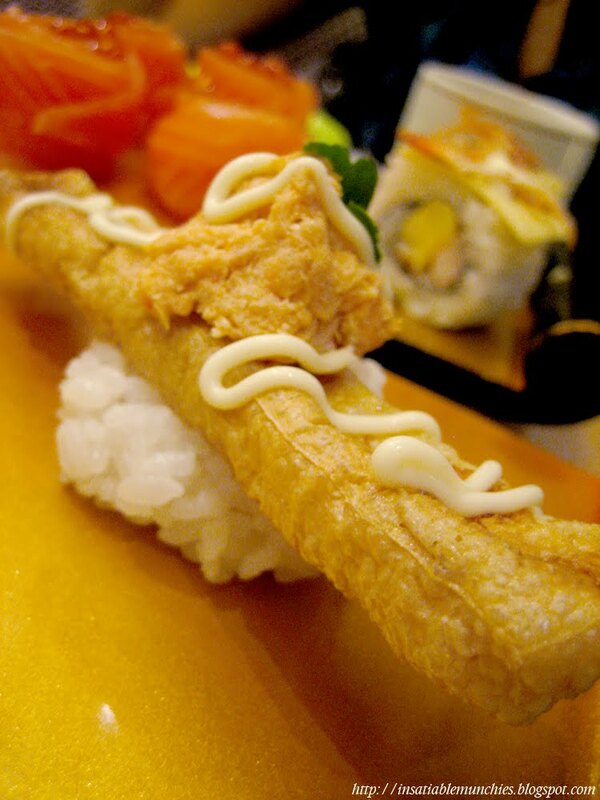 This Tuna and Crispy beancurd is unfortunately more theatrical in its look than it’s flavour. The crispy texture was a welcome surprise, but the overall flavour was rather bland. It’s really did not do the beancurd anymore justice than other Chinese crispy beancurd dishes out there. Another mildly disappointing piece is the Foie Gras sushi, as the foie gras did not have the creamy, buttery texture that I’ve come to expect from a piece of fatty goose liver treated right. It was slightly overdone, but not an absolute disaster. This Crab Miso Gunkan was worth the try. It wasn’t a phenomenally pleasant surprise, but it was a nice surprise nontheless. 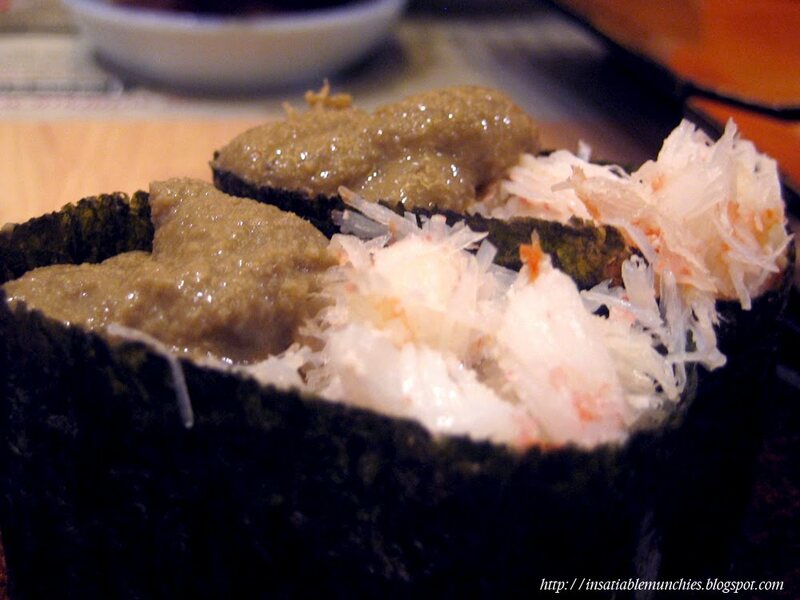 The crab was soft and light, while the miso packed quite a flavour punch. Not bad. This Baked Crab was absolutely delightful. 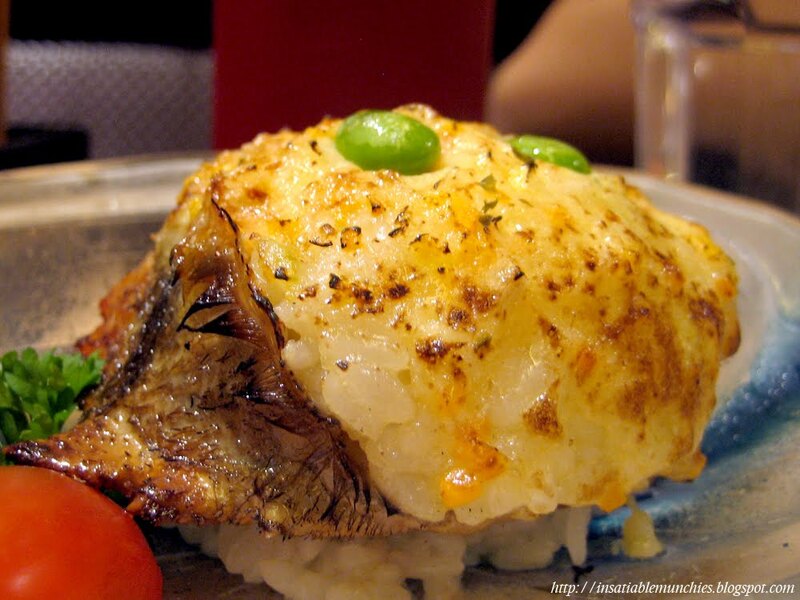 Crab shell was filled with a rice and mushroom mixture, and then baked with cheese over the top. Steam immediately escaped upon breaking through the helmet of cheese, and the aromatic mushrooms made their presence felt. Fluffy chunks of crab were carefully woven throughout the dish, and every mouthful was heaven. A must-try. 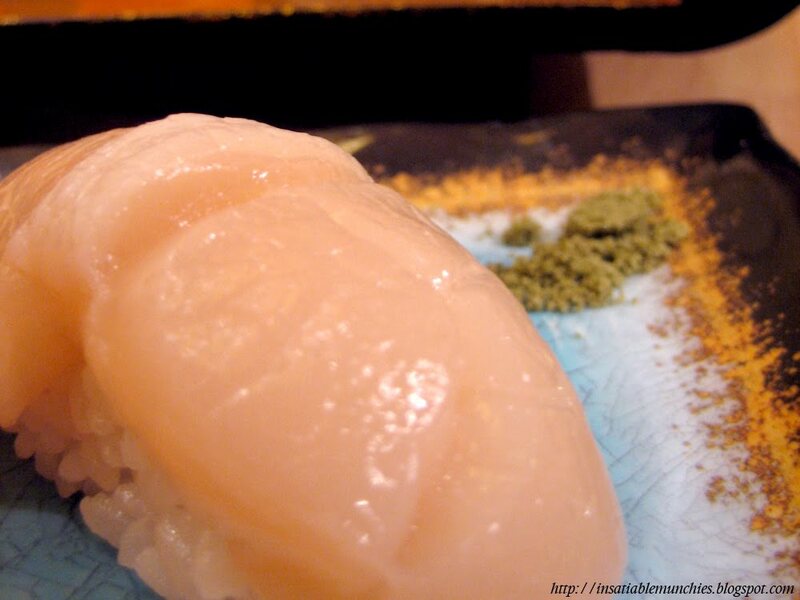 And who can overlook those delectable slices of raw fish? 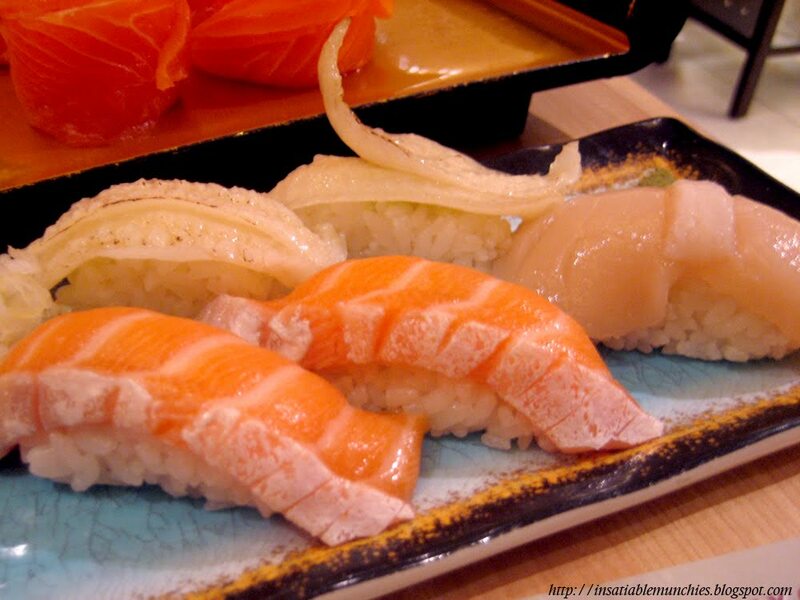 The fatty salmon was melt-in-your-mouth, but it does happen to leave an oily after-feeling. 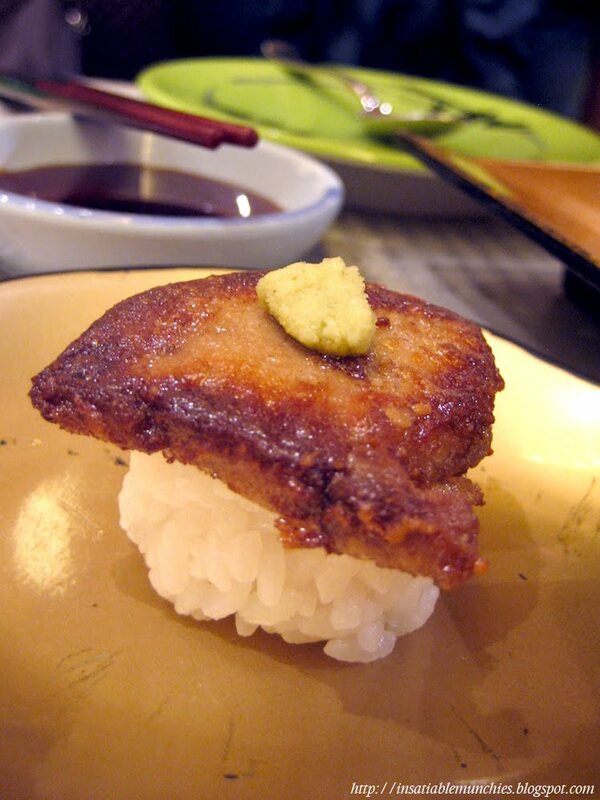 The dorsal sushi had the same effect, except for a slightly more complex texture. It seemed to have a slight resistance to it before it yielded to the determined eater. The Hotate was worth every bite, but sadly not the same can be said of the Green Tea Salt. It had a really odd flavour to it, and if anything, undermined the freshness of the scallop and made it seem old and…well, not fresh. Just have the scallop, it’s good enough as it is. 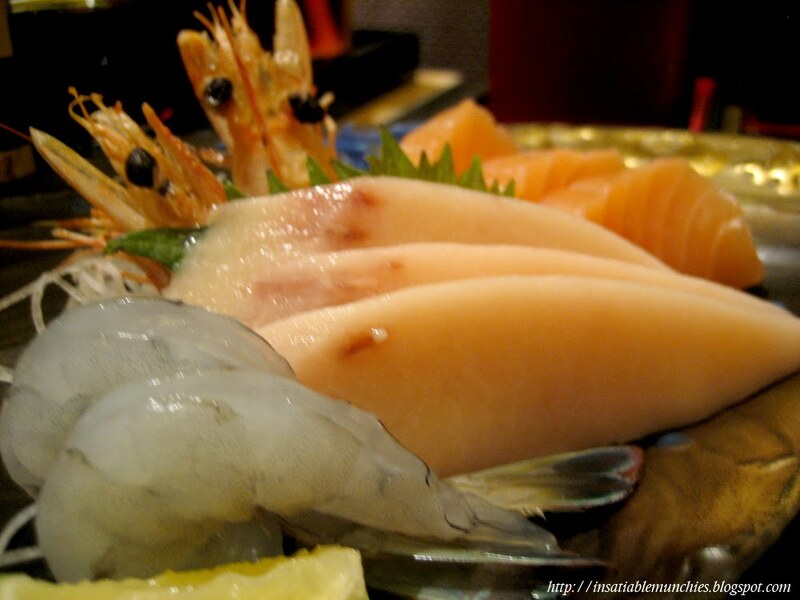 And who can forget the sashimi. As mentioned above, the standard of raw salmon at this joint is beyond reproach. It’s truly the best salmon sashimi I’ve had in my life. The swordfish lived up to the same standard, and melt-in-your mouth texture is the stuff of dreams. And the prawns. Oh my the prawns. The Fairy Prawns have a deep fried head and brings out all the flavour of prawn, and the sweet, succulent body is so delicate, so clean, so pure, that it almost makes me feel like I’m partaking in an act of debauchery by putting it in my mouth. If you have cash to spare and a reason to celebrate, this is definitely a place that you should visit. Reservations can be made, but there’s a SG$50 per head minimum. Otherwise, there will be a queue for dinner.